Autumn has arrived, and with it a wealth of beautiful seasonal produce, to celebrate l’Ecrivain are delighted to offer TheTaste Members our wonderful Seasonal Menu for only €75 for two people. 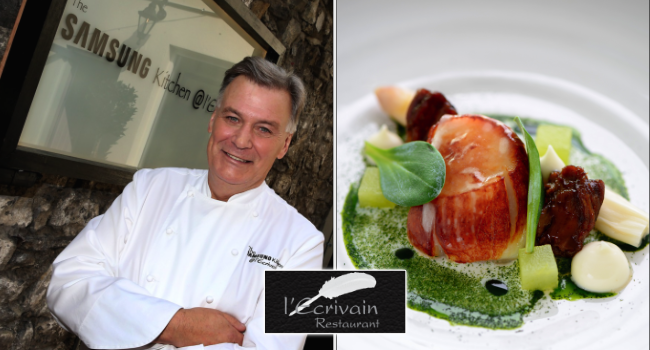 We look forward to seeing you – Derry, Sallyanne & all the Team @ l’Ecrivain. Today’s offer is your chance to dine in l’Ecrivain in November and experience 3 courses from their Seasonal Dinner Menu with tea or coffee and petit fours for 2 people for only €75, normally priced at €150. If there is one restaurant to treat yourself to this November this is the offer we would highly recommend. – Valid from November 1st to November 23rd 2016 (Monday to Thursday) – vouchers MUST be redeemed within this time frame as an extension will not be granted going into the Festive Season. – A signed copy of the menu is available on the evening upon request. – Vouchers will not be valid after their expiry date.